Is a Transfer Switch Necessary? Should You Buy Manual or Automatic Transfer Switch? Will your home is used as a source of power for an event outside? Is there a person with a disability in your home? Do you sometimes leave kids alone? How Much Power Do You Need To Transfer? 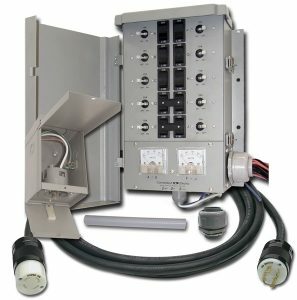 Should You Buy Inside or Outside Transfer Switch? Which is the Best: Plug or Hardwired? How do you Wire a Transfer Switch? The most critical safety device as far as installing a portable generator to your electrical system is concerned is the generator transfer switch. If you are wondering what a transfer switch is, or why you need one and how to connect to your generator, you do not have to worry because you are in the right place. It is equipped with a NEMA L14-20 power outlet. Are you searching for a reliable and safe transfer switch? The 31406CRK 30 Amp 6-circuits Pro/Tran Transfer Switch from the Reliance Controls Corporation is what you need. This switch will help you to quickly and safely transfer power from your generator to your house or the office. This transfer switch is designed to make the building wiring system accept all the power your generator will produce. This switch is ideal for standard homes and offices because it can transfer power produced by a generator of 7,500 watts and below. It works well with portable generators that have a NEMA L14-20 outlet. When you buy this switch, it comes with a kit which comprises of 30 Amps circuit transfer switch, an outdoor cord, a generator power cord with a capacity of 30 Amp, and lastly L14-20 cord which you can use for smaller generators. The 31406CRK 30, therefore, comes with a generous kit which will make the installation simple and quick. Reliance Controls Corporation is known to make genuine and durable products; you can attest to this because of the warranty they offer for their products. The 31406CRK 30, for instance, comes with an unbelievable 5-year warranty which covers the whole kit. This transfer switch has large and durable toggles to control the flow of current. This switch has three positions. Another crucial advantage of this transfer switch is that it comes with a well labeled and durable circuit wires. Allows an optional 240 volts output. The best transfer kit for any portable generator with an output of 30-amp or less than 7500 wattage is the EGS107501G2KIT EmerGen 10 Circuit Transfer Switch. This switch is nema L1430 registered. It is, therefore, safe to use in your home and office. It is not specific to the type of generator you have since it is compatible with almost all portable generators. The EGS107501G2 transfer switch eliminates any possibility of back feeding of power to the generator because it has two rocker switches. The switch and generator can be destroyed should the electric current return to the generator when the power from the main grid is back. It has two circuits which produce a voltage of 240V which ideal for water pumps and other machines. This switch is very flexible because it can be stored either indoors or outdoors. For outdoor use, there is a durable rainproof box. This box is included in the kit. The wattage meter is clear and easily accessible immediately you open the switch. You can, therefore, not overload your generator because the meter will aid you to control the load. This switch has ten circuits with 30 Amp. It also comes with a 10-foot power cord which is enough for all the installation purposes. The ten circuits are ideal for many standard homes and offices. It cannot, however, transfer power from generators producing over 7500 watts because it was designed for home use not in factories. If your generator produces more than this wattage, you should get a commercial switch transfer. 7500 W is enough for almost all homes. However, if you think there can be overloading, you should check the wattage meter and decide which appliances to switch off as you wait for the power from the main grid. Since it is UL Listed, you can comfortably purchase it and be assured of durability and effectiveness. Have a durable powder-coated cabinet made of steel. It comes with a double-throw switch. The wattmeter is very accurate. Are you looking for a transfer switch which can power a power intensive home or a medium business? A 51410C Pro/Tran 10-Circuit Indoor Transfer Switch will be just what you need. This transfer switch is designed to be installed in homes where there are power hungry gadgets which must be on even during power outages. If you constantly use furnaces and electric cookers, a simple portable generator may not help you. You must, therefore, a powerful 10000 watt generator to produce the power you need and an equally powerful switch. Many domestic and office transfer switches can only transfer the power of not more than 5000 watts. The 51410C Pro/Tran 10-Circuit Indoor Transfer Switch can transfer the power of up to 12,500 watts. This switch comes with a flexible conduit with easily attaches to the load center. It had a single circuit breaker which an amperage of 20 amps. This circuit breaker is resettable so you can use this switch to transfer power safely to difference electrical appliances. The casing of this switch is also very durable. Reliance Controls Corporation, who are the manufactures of this switch, has been in this business for so many years. Their products are known to be durable as you can see even from the general appearance of the transfer switch. This transfer switch has a clear and easily accessible wattage meter which will aid you to control the power consumption of your appliances. You also do not have to worry about the power flowing back to the generator when the current from the main is back because this transfer switch will automatically cut the generator current when the main grid power resumes. The most outstanding feature of this specific transfer switch is its easiness of installation. Even by nonprofessional can quickly install it. Unlike other switches whereby you have to seek the services of a professional electrician, you can install this switch provided you read the installation manual well. Uses the digital load management (DLM) technology which makes it efficient and safe. Can supply both 120 and 240 volts. 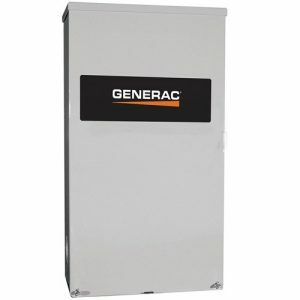 If you are looking for a transfer switch with an output of 120 or 200 volts, then get the Generac RTSW200A3 200 Amp Automatic Transfer Switch 120/240V Single Phase Rated NEMA 3R. It is among the few transfer switches which can supply both the 120 and 240-volt current. It automatically prevents power from flowing back to the generator. It has a Nexus switch which disconnects the switch when the power from the main grid resumes. Many transfer switches have either a 120v or a 240 volts output. With RTSW200A3 200 switch, you have the freedom to choose which output you need depending on the type of appliances you use. Every electrical appliance uses either 120v or 240 volts. If you have a machine which utilizes the 240v, but your transfer switch has an output of 120v, you will not be able to use that machine. RTSW200A3 200 is, therefore, flexible because you can alter the output of voltage. This switch has a nema 3R certification. It is, therefore, safe and reliable to use in your home or your office. Generac RTSW200A3 200 Amp Automatic Transfer Switch is among the most technology-savvy transfer switches in the market today. This is because it uses the general load management technology. This technology is only found in products made by Generac. When there is a power outage, you do not have to manually switch on the generator if you have the RTSW200A3 200 transfer switch. This is because it will detect the outage and switch on the generator automatically. The generator has to be automatic as well for this system to work as designed. This Generic transfer switch is very durable as can be confirmed by the 2- warranty. The fact that it is UL and CUL listed further shows that it is an efficient and durable switch. A transfer switch is basically the power joint between your generator cord and your home’s wiring. It is the gadget you see mounted on the wall at the end of the generator’s cord. It is simply a switch which transfers the power from your generator to your existing house wiring so that you will not have to use cords to power your appliances. This makes it possible to have a portable generator outside the house. The transfer switch, therefore, will prevent overlap of power and at the same time help you power up your home without using cords. Technically speaking, you can power up your appliances without a transfer switch. All that you need is the power and the appliance. However, a transfer switch will make your switch from mains grid power to generator easier and safer. Below are some of the reasons why you must have a transfer switch for your portable generator. You are required by the National Electric Code (NEC 700.5 and 7001.5) to install a transfer switch for each generator you run. The law is very clear that you must also have it installed properly. Maybe no one will come to inspect if you have a transfer switch in your home, but when the time comes to sell the home, your prospective buyer will check. Many outages take place when it is raining. You can imagine how bothersome it can be to be running up and down with cords while wet and there is no light. A transfer switch will help you minimize this hassle. If you have some hardwired appliances in your home, only transfer switches which will help you power them when using power from the generator. Extension cords can be dangerous especially at night when the power is off. They pose an electric risk because they can make you or your family member slip and fall causing an electric catastrophe. This increases the chances of a fire breaking out or someone getting electrocuted. The consequences of such accidents are expensive. It is prudent, therefore, to install a transfer switch to eliminate all these risks. There are many types of transfer switches in the market today. However, not all of them will make your home safe. Below are some of the vital features you should ensure a transfer switch has before you buy. Generally, transfer switches come in two types; automatic and manual. Later in this article, you will learn their differences. There is nothing as annoying like buying a gadget without the correct kits for servicing and installation. It is costly and time-consuming to go out and look for a kit which can service your transfer switch when you want to power up your home. Always ensure that the switch you want to buy has all the kits which are necessary for repair and installation. This will make the installation quick and easy. The most important requirement you should look for before buying a transfer switch is its wattage. To know the right wattage of a transfer switch you want to buy, you should first know the types and number of the appliances you have and the power of your generator. Almost all transfer switches in the market have the UL/CUL Certifications. However, it is critical to ensure that the switch you want to buy has it because it is not uncommon to have counterfeits in the market. All durable products have a generous warranty. To know how long your transfer switch will serve you, you can get a hint from the number of months the warranty covers. Warranty will give you peace of mind because you will not expect accidents. As earlier stated, there are two types of transfer switch. Below are some of the features you should know so that you can buy what is best suited for your needs. The Majority of portable generators use manual transfer switches. If your portable generator has an electric switch, you can use an automatic transfer switch. What are the factors you should consider to know if you need an automatic transfer switch? For many people, being generous with space and power is fulfilling. It is, therefore, necessary to consider if your home w ill will supply power to events. Automatic switch transfers are best suited in such cases so that people will not have to enter your home to get the electric power. If you have folks with a disability in your home, it is fitting to buy an automatic transfer switch for the obvious reasons. Sometimes the power can go off, and there is no one to manual switch on the generator. If you sometimes leave at night and leave your children home, you should also have an automatic switch transfer. Electric current can be very dangerous if handled by someone who is not sure of why he is doing. Nobody likes power outages. It is even more annoying to know that you have to stop what you are doing and move to the switch every time an outage occurs. If you want to remain calm as the mains go off and immediately get supplied with the power from the generator, then go for the automatic electric transfer. The manual transfer switch as the name suggests, allows you to switch off and on using your hand. It allows you to manually switch the power source from grid to generator with the flip of the switch. You must access your switch when there is a power outage. You can also manually manage other power load getting to your appliances. It is relatively affordable. Compared to the automatic electric switches, they are inexpensive. Easy to manage loads- Since there are switches under each circuit, it is easy to control the load. This will prevent the dangerous overloading which can start a fire or damage your appliances. Setup is easy- Since there are no moving parts inside, the setup is straight forward. Not many people like manually doing things when there is an automatic option. Children and people living with a disability cannot safely operate it. The main advantage of an automatic switch is that as soon as the power in the grid is lost, the automatic switch will activate the generator. This means that you will not have to go where the switch is when the power goes off. It is automated. Many people like automation. If a switch can operate itself, there is no need to do it manually. An automatic switch does not require manual switching because the ATS automatically switches. Programmable- this enables the ATS units which are programmable to allow more current to flow to the essential appliances. Expensive- Automatic switch transfers are expensive because they have more features as compared to the manual switches. The other this you need to consider before buying a transfer switch is if the switch will power all your appliances comfortably. You first have to come up with the figure of total needed wattage and compare with the power output of your portable generator. You also need to decide which circuit will always be on and which ones can alternate so that you will not overload the whole system. This is critical because if you open all the circuits and run all the appliances at the same time, you might destroy the appliances or the generator. On the other hand, if you have a standard home with very few powers appliances, you can go for the single circuit transfer switch. For a single house which uses 600W, for example, two supply circuits which will provide up to 3600W are needed. This is enough for many homes. Many homes have at least ten circuits. You do not have to buy a 10-circuit switch because the power from the main grid is far much more than from your generator. In other words, you have to sacrifice some appliances and keep them off as you wait for the power to return. You can, for example, switch off the electric cooker and keep the television and lights as you wait for the power outage to end. However, if you have power hungry appliances which must be powered perpetually, the only option is to buy a bigger generator. As earlier stated, you should be guided by the amount of power your appliances consume. This is simple to know because all the electric gadgets have an imprint with the wattage they consume. You, therefore, have to come up with the total wattage your home uses and the maximum generator output. Let’s assume that your house has 15 circuits- like many standard houses. If you have a generator of 4000W, the ideal transfer switch should have six circuits. This circuit can power up to 5000 W.
Below is a guide on your domestic appliances uses the power. This will help you decide the best switch circuit. You must have used such a guide to buying the best portable generator. The first five can run on the one side of supply and the other on side two. From the above example, the total running power will be 5800 watts. Note that the output should be a little bit high. In a nutshell, you can quickly determine the power you need to transfer, add the lower total run and the surge. Our generator wattage calculator will help you to know your requirements. All the transfer switches come in two models; outside one and an inside one. You should not install an inside switch outside of your house because it can be destroyed by rainwater. It is easy to differentiate them because the outdoor is labelled with a NEMA 3R code. They are at times also referred to as the rain-tight transfer switch because of the water-tight boxes which house them. However, to know if you need the outdoor or indoor transfer switch, you need to consider the following facts. The space you have. Although transfer switch is not big, you need a good space to install them so that they will not be interfered with by when you are doing other home activities. Space should be high enough to discourage children from playing with the switch. Accessibility – Transfer switches should be easily accessible because you mostly need them when there is a power outage. It should, therefore, be situated in a place where you can easily access all its switches. 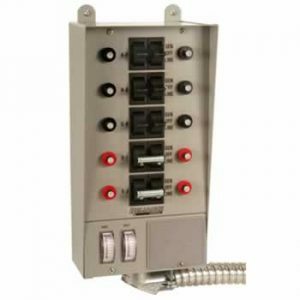 Safety – Transfer switch is not cheap. If you live in an insecure place, make sure you install it in a place where a thief may not access it easily. 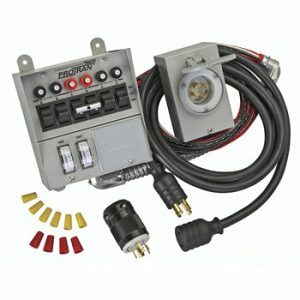 Generator transfer switches come with two configurations; you can buy a wired switch or a non-wired one. Buying a transfer switch which is not wired means that you have to wire them yourself or get services of a qualified electrician to do it for you. On the other hand, the prewired ones have everything properly in place, and your work will be to connect them to the mains only. However, the prewired transfer switches are a bit more expensive than the non-wired one. Therefore, since both work similarly, the choice will boil down to your budget. In contrast, if the place you want to install the switch is far from your house, it is advisable to buy a pre-wired switch. So, before you make the final decision, know the length of the wires you will use and estimate the cost of labor of installing the non-wired transfer switch and compare the costs. You might realize that getting a prewired switch might be cheaper in the long run. A switch which is hardwired is firmly connected with the electrical cords. They do not have joints and hence need less maintenance. On the other hand, the plugin transfer switch has a joint between the switch and the cord. If you want to know which the best switch is for you, you need to consider where you are installing the switch. If it is permanently fixed in one, a hardwired one will be good for you. On the other hand, if you need to be moving your generator from one place to another, a plug-in transfer switch is what you should have. Remember to ensure that your transfer switch is firmly installed because if there are loose cords, they can cause accidents and destroy the switch. The height of the switch from the ground should also be high enough to discourage children from playing with it. If you have a transfer switch and a portable generator on the ground, the next and last step is to wire it. When it comes to wiring transfer switches, it is better you leave it to professionals. A simple mistake can blow up the whole system or even cause and electrocution. However, it is always good to know these steps which the electricians will use to install the switch. This will aid you to know what you should pay for the labor. Get a good location for your switch away from rain ad children interference. Securely mount the transfer switch to the wall. Ensure that it is firmly fixed on the wall. Turn of the main power of the house. You should do this from the main switch. Connect the wires properly from the switch to the circuit breakers which you need to control. Install the electrical box which is included in the kit. Connect the outside wires with the inside ones. Start your portable generator and let it warm up. Test how the things are by switching off the mains and switching the transfer switch on one circuit after the other. Flip on the switch to the generator to switch off. If you see or hear sparks, disconnect everything and investigate where the problem could be. If successful, which it should be, flip back to the generator line and switch off your portable generator then switch the mains on. Lastly, seal the holes you made and repaint the part of the wall which may have been destroyed in the process of installing the transfer switch. It is critical to note that the above guide is not meant to aid you to install the unit unless you are qualified to do so. It is illegal to attempt to do an electrical installation if you are not qualified. In conclusion, it is now clear to you what the generator transfer switch is and why you need one. You can now make an informed choice and buy the ideal transfer switch for your specific needs. A transfer switch is an expense you will have to incur once. Since it is a costly gadget, we hope this article has aided you to get the best switch so that you will not have to buy another in the near future. Ah, The Good Old Dual Fuel Generator - Isn’t It Wonderful?